When I first got my iPad I expected my virtual bookshelf to grow more quickly than my physical one and I knew would start controlling iPad games with tilts and shakes. The device has provided a constant succession of little pleasures, but when I heard I could buy an app that turned my iPad into a mouse I started to really believe. Maybe the iPad does change everything. Enter Mobile Mouse, one of the few apps I’ve come across thus far that has completely changed what I think about the capabilities of the iPad. It’s an app that connects to your computer through WiFi or network server and turns your entire iPad screen into a remote trackpad. As much as I was in awe of the idea, I couldn’t help but let skepticism sink in. The creators of the app, R.P.A. Tech, are very upfront about the fact that Mobile Mouse does not work as accurately a regular mouse and is not meant to serve as a replacement for your current device. It turns out that their warning is more cautionary than anything else. The app works better than I expected and their disclaimer is like the faded dry clean only tag attached to your favorite sweater you’ve washed at home dozens of times. If I knew my network connection would work 100% of the time I would at least consider shoving my primitive USB mouse into the depths of my bottom desk drawer. For now my mouse is sitting elsewhere on my desk and my iPad is sitting next to my keyboard with smudged fingerprints everywhere. I’ve been using Mobile Mouse all day and it has worked great. Enough ranting for now though, let’s get into the specifics of the app. When you first download Mobile Mouse the first thing you want to do is go to their website. Don’t open the app and try to figure it out that way. You’ll want to go to Mobile Mouse website and download their desktop application straight away. While the app works for both Windows and iOS, I have Tiger and feel like I can only provide accurate first hand experience about the Mac. I assume the app works the same across the board, but feel like I should be completely candid on that point. The Mac download is quick and as soon as the application is installed you can open the app on your iPad. The application will fill the screen and flash a connected signal on your screen. The settings in the upper left hand corner shows the server where you are connected and lets you turn the sound on or off, turn pinch to zoom on or off, change Frequency, make your mouse left handed, and adjust the sleep and wake settings of the app. You can also access social media entities and leave a review about Mobile Mouse on the app though the Support button. When you run your finger across the iPad screen where you touch is highlighted in a subtle yellow. The actual mouse sounds feel a little delayed so I turned those off immediately, but everything else is pretty much what you’d expect out of a mouse along with an icon view of your applications and a couple extra menu features. You can tap the screen to click regularly, use two fingers to right click (using the control key with your keyboard doesn’t work), and do things like drag entire windows around by tapping both fingers on the top of the screen and then dragging around. Then to let go of the window you tap again. This last move is a little bit difficult to execute, but everything else is extremely easy and instinctual. If I had to compare Mobile Mouse to anything I would say it was somewhere between a trackpad and a regular mouse. The app supports two finger scrolling and limited pinch to zoom capabilities (e.g. not on webpages it seems) but doesn’t let you use three fingers to swipe back and forth between webpages. Instead you’re left to navigate the old fashioned way. One thing that’s great about this app is the fact that you can use the Music notes icon to open up an in app iTunes control that includes play, pause, volume, store, shuffle, menu, visualizer, full screen, and genius buttons. You can also eject a disk from that panel and much more. Another great feature is the in app internet control. Also convenient for when you’ve taken your iPad to the couch and want to navigate the particulars without being able to see your screen, this panel lets you go home, back, forward, reload, open a new tab or window, and more. Everything in these menus is simple to use and very user friendly. 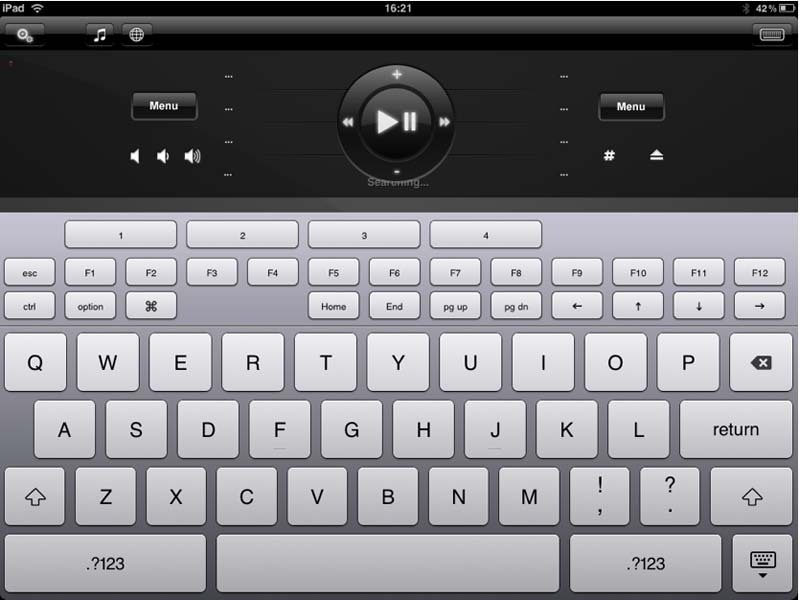 The upper right hand corner pops up a keyboard that lets you type as you would with any other iPad keyboard experience with slightly different keypad features. For example, the layout includes page up, page down, F# commands, esc, ctrl, option, and home and end. Everything you type shows up in bold white type along the top of the iPad screen as it registers in whatever program you’re working in on your computer. If the iPad keyboard were easier to use I’d say this is a great feature but mostly I see this working well for couch dwellers who can’t see the computer screen very well and find it easier to track their search query for the next Hulu show on their iPad screen as opposed to squint at their computer from far away. All said and done I was shocked by how well Mobile Mouse works. It’s not perfect and unless you’ve got your iPad plugged in it’s probably bound to drain your iPad battery a bit after a lot of continual use, but I’m thoroughly impressed. It’s not totally and completely multi-gesture yet, but after a few updates I’m sure you have every right to expect big things from Mobile Mouse. This is a great app to impress your friends and showcase just how revolutionary your iPad is. I wouldn’t throw your regular mouse away just yet, but this is much better than any other iTunes remote I’ve seen on the iPhone or iPad and this could change the life of people who watch tv on their computers but have to get up every time they want to adjust the volume or watch a new show. And if your mouse broke in some cataclysmic fall when every office supply store in your immediate area is closed Mobile Mouse could very well fill in as a perfectly reasonable substitute. Bottom Line: Mobile Mouse is a great fill in remote mouse with great ease of use and features. This app already beats every computer remote I’ve seen on the iPad and iPhone and with a few improvements it could very well compete with Apple’s own trackpad (providing you have a consistently reliable network connection).